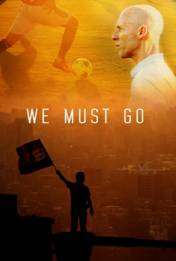 With the World Cup in full bloom and worldwide fan support set at a fever pitch, the documentary We Must Go is a perfect complement to one’s soccer obsessed climate. Directed by Dave LaMattina and Chad N. Walker, the project centers on coach Bob Bradley’s determined fight to take the Egyptian National Soccer team to the 2014 FIFA World Cup. If you’re looking for a puff piece on Bradley or a predictable happy ending, We Must Go will turn those expectations on its very head. Diehard soccer fans know Egypt fell short of a World Cup appearance and Bradley is now the coach of Stabaek in Norway. Winning and losing takes on a different color in Egypt, where politics and soccer are dangerously intertwined. In heartbreaking and even eyed fashion, the documentary also chronicles the Port Said tragedy in which 74 people perished in a soccer match. Dahlia and Yasmine Khouzam, the mother and daughter of one of the individuals killed in the incident, are also interviewed in the documentary. We Must Go is currently available on iTunes, Google Play, and Amazon.